You just finished installing Linux / BSD / Mikrotik router on a PC and then you want to put it on a rack or cabinet but the PC router keep showing ‘WARNING 0211: Keyboard error‘ because no keyboard is connected to the PC router/server? The warning message just warns you that there is no keyboard as an I/O connected to the router / server. You can simply connect a PS/2 or USB keyboard to the server / router and then press F1 button to resume the booting or DEL to run Setup. However, we don’t keep a keyboard connected to the servers / routers installed on rack / cabinet. When the servers / routers restarted, you need to connect a keyboard to press F1 to resume. 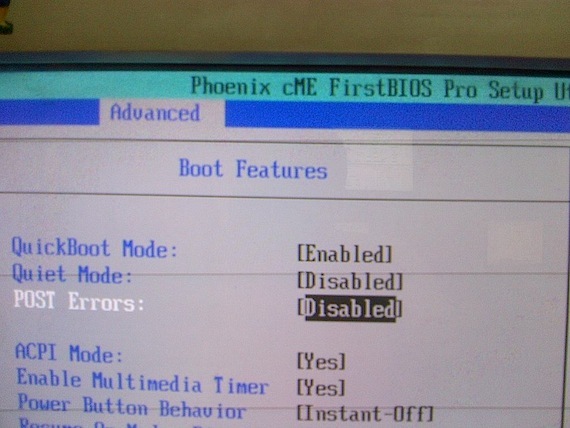 If your PC server/router uses Phoenix cME FirstBIOS Pro you can get rid of this message by disabling the POST (Power-On Self-Test) Errors on BIOS setup. On this BIOS version, you can disable this warning in the Advanced > Boot Features. Set the POST Errors option to Disabled so system will always attempt to boot instead of pausing and displaying Setup entry if error occurs on boot.